This year’s International Day of Biological Diversity (May 22) focuses on islands. Bradnee Chambers, Executive Secretary of the Convention on the Conservation of Migratory Species of Wild Animals discusses the impact of the growing problem of marine debris on islands’ wildlife and the economic and environmental consequences. BONN, May 21 2014 (IPS) - Some of the Earth’s most delicate tropical paradises are being disfigured by the by-products of the modern age – marine debris: plastic bottles, carrier bags and discarded fishing gear. Just a tiny fraction of this originates from the islands themselves – most is generated on land and enters the sea through the sewers and drains; the rest comes from passenger liners, freighters and fishing vessels, whose crews often use the oceans as a giant waste disposal unit. While much of the garbage sinks, some of it joins the giant gyres where the currents carry it across the globe. "Marine debris casts its ominous shadow and threatens to break the virtuous circle which would otherwise guarantee sustainable livelihoods and incentives to protect wildlife." Small Island Developing States (SIDS), recognised as a distinct group of nations by the UN Conference on Environment and Development in 1992, lack the space to dedicate to landfill sites and do not have the resources to deal with the huge problem of marine debris that is being washed up on their doorstep – as the tides and currents wash the accumulated marine garbage onto their beaches. Domestically, they can take steps to ensure that they do not add to the problem – American Samoa for instance has banned plastic bags – but the “polluter pays” principle would require that those responsible for producing the waste should be made responsible for disposing of it properly. A litter-strewn beach is an eye-sore and with tourism playing a major role in the economies of many island states, marine debris can have substantial adverse financial implications threatening local businesses and employment prospects. Palau has banned commercial fisheries in its huge territorial waters forsaking the lucrative licensing revenue and will develop ecotourism based on snorkelling and scuba diving as a sustainable alternative. Alive, Palau’s sharks can bring in $1.9 million each over their life-time. Dead, a shark is worth a few hundred dollars, most of it attributable to the fins used to make soup considered a delicacy in parts of East Asia. In February, Indonesia became the world’s largest sanctuary for manta rays and banned the fishing and export of the species throughout the 2.2 million square miles surrounding the archipelago. The numbers are about the same; as a tourist attraction, a manta ray is worth in excess of 1 million dollars; as meat or medicine no more than 500 dollars. Whale-watching creates jobs while bird-watching boosts binocular and camera sales and both help hotel occupancy rates. And the total number of international travellers broke the one billion mark for the first time in 2012 making tourism one of the main foreign exchange earners globally particularly for many developing countries, including SIDS. But marine debris casts its ominous shadow and threatens to break the virtuous circle which would otherwise guarantee sustainable livelihoods and incentives to protect wildlife. Sea birds inadvertently feed their young with plastic which then blocks the chicks’ intestines preventing them from eating properly and leading to a slow and painful death. The staple prey of some marine turtles is jellyfish but the turtles often mistake plastic bags for their favourite food with same dire results. 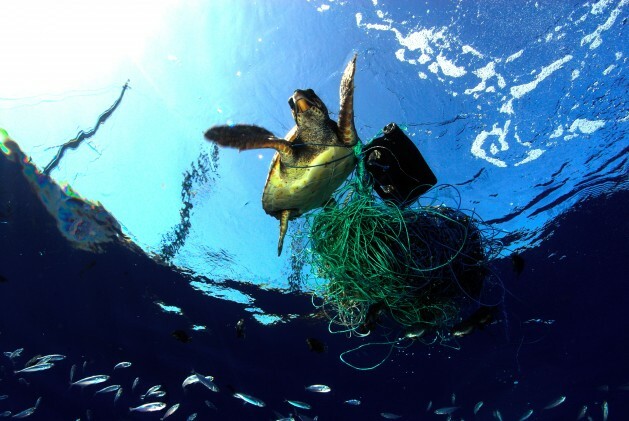 For larger species such as whales, dolphins and seals, discarded fishing gear – ghost nets – are a problem as the animals become entangled in them. This can impede the animals’ movement and ability to hunt as well as cause serious injury or even death through drowning. Remote island habitats support a rich and diverse fauna often including unique endemic species and provide vital stop-over sites for migrants and breeding sites for marine birds. But long established bird colonies have fallen victim to another danger exacerbated by humans – that posed by invasive alien species. The problem of rodent infestations is well documented. Mice and rats have escaped from ships wreaking havoc on the local bird populations which had previously nested on the ground with impunity as there were no predators. Eradication programmes have successfully rid 400 islands of their alien rodents. Less well known is the phenomenon of “rafting” where the invaders also use marine debris as a vector – plastic bottles are harbouring a potentially devastating assortment of worms, insect larvae, barnacles and bacteria, and warmer waters arising from climate change increase the resilience of these unwanted stowaways making them an even more potent danger. One of the fascinations of dealing with the animals covered by the Convention on Migratory Species is how they link different countries and even continents. Many of the species are endangered and their conservation as well as the threats that they face require internationally coordinated measures. This applies to marine debris, a singularly unwelcome “migratory species” whose continued presence CMS will be doing its utmost to eliminate. Sad reality – which we ALL must work hard to change!